Lucero Picazo Gonzalez was born on January 4, 1944 in Nueva Rosita, Coahuila, Mexico. 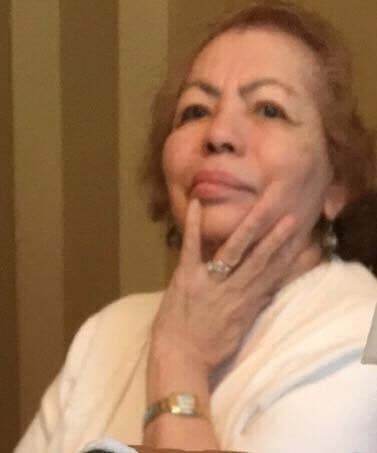 She passed away on March 14, 2019 in Mesquite, Texas. Lucero is survived by her husband of 58 years, Porfirio González and their children Gerardo and Deborah González (granddaughter Esperanza †); Josue and Janet González and grandchildren, Jessica, Andrew, and Emilee; Sara and Dave Gilbreath and granddaughter Logan; Diana and Hugo Martinez and grandchildren Haylee and Daniel; Alejandro and Saraí González and granddaughters Natalee and Cydnee; as well as her loving sister Juanita Picazo and brother Lorenzo Picazo. In addition to her beloved family, Lucero is survived by an enormous family of friends. She is preceded in death by her parents Sara Lopez and Antonio Picazo, and her sisters, Dolores Picazo Alfaro, and Bertha Alicia Picazo González. Lucero grew up in Nueva Rosita. As a teenager she enrolled at Colegio Bíblico in Eagle Pass, Texas where she met who would soon become her husband, Porfirio González. They wed on February 11, 1961 in Allende, Coahuila, Mexico. In 1968 they made the move to the Los Angeles, California area with their two young sons. They lived there for the next 30 plus years where their last three children would be born and raised. In 2002, they decided to join their children in the state of Texas where they lived for 17 years before she was called to her Heavenly home. Lucero worked her entire life, sometimes up to multiple jobs at a time. She made sure her family was provided for and well taken care of. Her home was a revolving door. All who entered were always welcome and provided for. She never turned anyone away. That was her character – loving and nurturing. She was first a strong woman of faith and then a loving pillar for her family. A Godly woman she was. A prayer warrior at all times. A devoted Christian for life. She truly led by example. She was a witness for Jesus Christ and influenced the lives of many. Her most joyful moments were leading many to faith in Christ and having her family active in church. Without a doubt Lucero’s most treasured and important role was that of “mom” and “grandma.” She was amazing and adored. What a blessing she has been and what a legacy she has left. Lucero had many gifts, among them were friendship, compassion, encouragement, listening, advising, being a “second mom” and “grandma,” having a keen sense of humor and being a wonderful story teller. Lucero’s talents were wrapped in warmth, sincerity, generosity, wisdom, love, fun, and laughter. She made everyone feel comfortable and she loved people without judgment. WE celebrate Lucero’s life because it was a life that was well lived and well loved. Even in her absence, she will continue to touch hearts. Lucero Picazo González you are Forever in our hearts. After the funeral services, we will then be escorted to the burial site at Laurel Oaks Funeral Home. All guests are invited back to church, Iglesia De Cristo Bella Vista for the reception where lunch will be served. We thank you all for your prayers and sharing this day with the family.